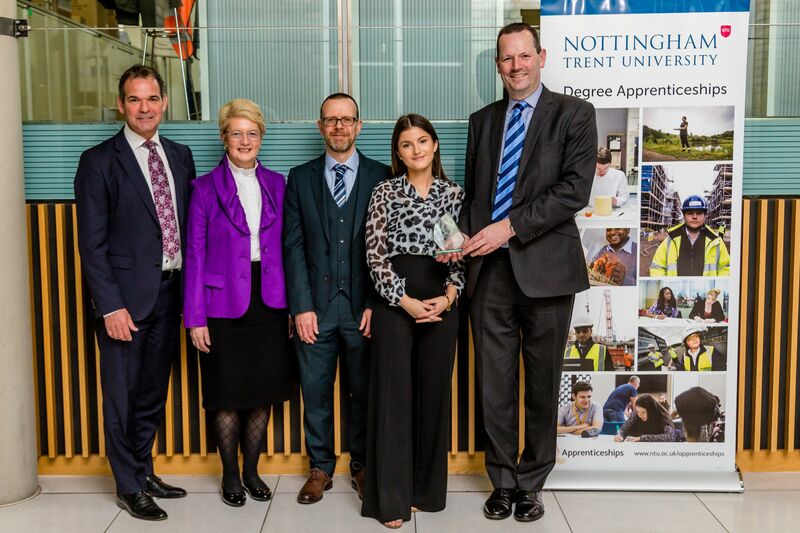 Taking place during National Apprenticeship Week 2019, NTU hosted their first ever Apprenticeship Awards. This event celebrated the many excellent apprentices and employers who have engaged with NTU's apprenticeship programme over the course of the year. The evening saw companies such as Gleeds, Kerry Foods and Experian be presented with awards, with categories celebrating both apprentices and employers across numerous industries and sectors. Emily was employed by NTU as a Trainee Buyer in April 2017 and is currently studying a level 4 Chartered Institute of Procurement and Supply degree apprenticeship (CIPS). Emily is extremely knowledgeable in all areas of procurement from sustainability to contract management. Emily is now passing on her earlier experience and knowledge of the apprenticeship by mentoring one of the Science Technicians who is new to procurement and has also just commenced a CIPS Level 4 apprenticeship. Inta has been a committed member of the Kerry Foods Technical Team at their Attleborough site in Norfolk and joined the Food Technologist Level 3 apprenticeship at NTU in January 2018. Inta takes exceptional ownership of her self-development and continuously takes a proactive approach, as demonstrated by consistently asking for feedback from members of the NTU course team on how she can improve further with her academic performance. In the workplace, Inta conducts herself in an extremely professional manner, demonstrating outstanding respect for all other members of the Kerry Team. Inta is a confident ambassador for her department by taking pride in everything she does. For example, by presenting at her last skills assessment that she had written a new manual handling procedure for the business and delivered the training herself. Inta has no problem working with different teams in different departments, at all levels. She is confident, driven and determined and works tirelessly to attain high standards in all competence areas. Claire is part of the first cohort of the Digital and Technology Professional degree apprenticeship at NTU. Claire has become the course representative for the cohort, taking time out from work to attend course committee meetings. It is key for each cohort to appoint a positive and committed representative. Claire's Academic Tutor at NTU has been extremely impressed with her commitment to actively participate and achieve good results during the apprenticeship. Matthew currently works within the commercial team for Keyclad Ltd, one of the UK's largest facade and roofing contractors, and is studying Level 6 Chartered Surveyor (Quantity Surveyor Pathway) degree apprenticeship. As soon as Matthew began his employment at Keyclad, he showed clear commitment to gaining as much knowledge and responsibility as possible. Matthew has also contributed to Keyclad gaining closer links with education institutions and is a member of the Young Apprentice Ambassador Network (YAAN). Matthew has recently been promoted to Assistant Quantity Surveyor due to his hard work, desire and ever growing technical knowledge. Matthew has exceeded all expectations in his first year at University by achieving first class results in every module. His attitude to work is consistently conscientious and detailed, with all his valuations, cost breakdowns and correspondence letters containing the correct amount of detail and substantiation to avoid confusion. Joanne has worked as a Medical Laboratory Assistant in the Pathology department of Chesterfield Royal Hospital for the past eighteen years, and in that time has gained valuable knowledge of the health care industry and the practices within a laboratory setting. Joanne's goal recently has been to train to become a Biomedical Scientist by undertaking a Level 6 Healthcare Science Practitioner. Joanne was initially concerned about the length of time she has been out of education and the fact that she has not studied in a higher education establishment before. However, Joanne has demonstrated a high degree of personal motivation and this has translated into the progression that has been identified, thus the reason for this award. Joanne has achieved high grades in all her assignments and exams that have been set for her so far. Both of the apprenticeship tutors on the course have been extremely impressed with how Joanne has taken to the level of study she is undertaking, as well as the achievement of good results. Joanne is proving to be an extremely dedicated apprentice who tackles each task with diligence and determination, actively participating in group tasks. Gleeds is an international property and construction consultancy company, providing impartial services to businesses and investors from seventy one offices, twenty one of which are based in the UK, including Birmingham, Milton Keynes and Nottingham. From commencement of their degree apprenticeship, students are given access to Gleeds' Career Pathway Development Guide, which helps them visualise their future development, from initial training, through to becoming qualified and on to management level positions. The Gleeds Professional Skills Programme (PSP), which guides employees to consistently develop, has been aligned with the apprenticeship training timeline and is flexible to the needs of students, fast-tracking their development where necessary to navigate course deadlines. Gleeds apprentices have provided case studies for Women in Construction and represent NTU in promotional videos, provided brochure photos and have taken part in MP's visits. Fifty years ago, whilst learning carpentry skills during his own apprenticeship, Michael Hillson had the vision to start a business himself, and MJ Hillson Ltd, a labour-only carpentry sub-contractor was born. MJ Hillson's apprenticeships have helped to develop people that not only work within the company, but also those who have gone on to prominent positions within the construction industry or to become successful business owners themselves. MJ Hillson's attribute a large part of their continued success to the fact that their workforce is currently made up of 25% Apprentices/ Trainees, unique for a company of that size. The company forms vital links with schools, colleges, training providers, tutors and parents, and believe these relationships are formed as a result of honesty and transparency in ensuring the correct delivery of an apprenticeship programme, alongside NTU. For more information on apprenticeships at NTU, contact our apprenticeship team at apprenticeships@ntu.ac.uk.